One night, Popeye rows his dinghy into the harbor of Sweethaven. When he arrives there everyone seems to fear him. He rents a room at the Oyls' boarding house, where he falls for their daughter, Olive. Olive's hand has been promised to Captain Bluto, a bully and ruffian who is in charge of collecting taxes for the mysterious Commodore. Popeye and Bluto are quick to dislike each other and fight. It’s like they’ve taken everyone from the Popeye cartoons and brought them to life. The whole cast is awesome! Also, although there has been many Popeye cartoons we’ve only really seen the origin story in print in the E.C. Segar comic strips, more on those later. Geezil: What is that glop you're eating? Wimpy: It's a soup burger. These are difficult times. Burgers can't be choosers. 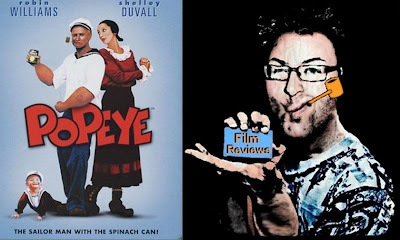 Popeye: I found him in Sweet Haven, that's why I am calling him Swee'Pea. That is his name. Olive Oyl: Swee'Pea is the worst name I've ever heard on a baby. Popeye: Well what do you wants me to call him? Baby Oyl? How the hell did Popeye get his huge arms anyway? Is it in any association with his squinty eye? i love this film although there's alot of undecipheral muttering from popeye, but robin williams is perfect. the songs are funnily good brad! i like the slow musical beat all the way through as they complete everyday tasks and the acrobat way they achieve itwhile the film rolls along. Olive's hair and outfit are spot on. The only problem with it is that i remember popeye's dad as THE MARTIAN in his popular tv series many many moons ago! If you listen carefully it's not actually undecipherable. He comments on loads of little things going on around him. Maybe its just your old vhs copy causing you not to hear it?